Yorkshire Wine Experience: Some wines from Italy that tasted pretty good to me! Some wines from Italy that tasted pretty good to me! Why is Italy such an exciting country for wine lovers, while France is such an intimidating one. It's not like Italy is any easier to understand. The regions still tend to give name to the wine and you don't even have the comfort of well known grape varieties to give you an idea what you're getting. For me it's the earthy generosity of the wines and above all ripe reds and fragrant zesty whites which compliment the equally rustic and deceptively simple cuisine of Italy. I will be coming back to Italy and Looking at particular regions in future posts so this is just a catch up of a few Italian wines I've had recently that seemed particularly good value. This has the classic aroma of rose and generous sweet red fruit on the palate without being overly concentrated or extracted. It has some balanced tannin which gives it a dryness and bite on the finish but at no point seems too much for the wine, which you might expect at this sort of price. This was a well balanced and enjoyable wine and a cut above the usual supermarket Barolo fare. It has some of the elements that you might expect in a wine twice the price while not having the class or concentration of the more expensive stuff it has more than you expect for twelve pounds. This has something like the feel of place that I look for in fine wines and for that alone it has to be worth the entry price. 19/20 for Value 18/20 for Barolo where money is no concern. This is pretty cheap and cheerful fare too not quite as juicy as the Frapatto( mentioned in an earlier post) but with plenty of summer berry fruityness. This comes from Piedmont the same region as the Barolo but is a million miles removed from the weight and complexity of those wines. This is another fresh and fruity summer red with a nice sideline in mouthwatering acidity. Lovely cherry aroma and blueberry blackcurrant on the palate this is a slightly simple even one dimensional wine but tastes as fresh as if the grapes were picked last week. Now were back to something with some weight, from the wonderful Ascheri stable this is all dark fruit and autumn spice. This is Piedmont again and balances somewhere between the Barolo and the Dolcetto. It has the vibrancy and fruityness of the Dolcetto and some of the weight and character of the Barolo. A wine to suit fans of New World wines this has a real ripe and juicy blackberry/plum/damson thing going on getting close to jammyness. It has a nice rounded lush weight in the mouth that makes it feel a bit serious and satisfying without it getting dry or oaky. Most of the vineyards around Alba are planted with the more illustrious Nebbiolo grape so Barbera is more often to be found in the fruity and easy drinking style from Asti but wines like this show the grape can give something altogether more dense and intriguing. A really lovely wine from an excellent company who rarely make anything less than excellent wines. Might just be in my top 10 of Red wines for the last twelve months. This is the real deal from the guys who re-introduced the apasimento method and it is simply brilliant. Made with grapes that have been allowed to dry over the winter so all the flavour and sugar is concentrated and then fermented slowly to extract as much of everything that can be extracted. This wine is like the amp in spinal tap that goes up to 11 its just that bit more. Fabulously concentrated and rich the wine has an opulence that makes you slow down and relax into the glass. It's not over done but it has a presence that is not about huge oaky savour or tannic heavyness it's much more welcoming and relaxed than that. Again the balance is very fine and the fruit, the alcohol, the tannin are all there giving a structure that holds all the other elements in place allowing them to unfold slowly as you work your way down the glass or the bottle. I've said in the past that there is a danger with wines from regions or producers that have a reputation of being underwhelmed, well that is not a problem here. This is everything that a red wine drinker could possibly hope for layers of flavour and aroma that develop from one sip to the next. One second cherry and the next cedar and liquorice but all the time staying alive and fresh. This wine is like Cassius Clay before he became Mohammed Ali hard to put your finger on but with a mighty wallop. 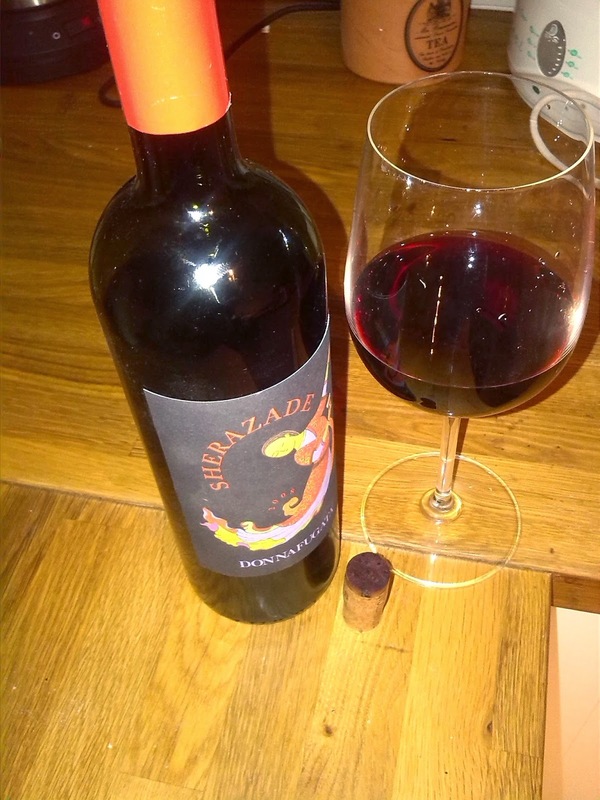 This Sicilian red is based on Nero D'Avola and while it has good intense black fruit aromas and some spicy depth on the palate it does not have a heavy tannic weight. This again is that lovely balance of generous fruit and rustic earthiness that makes so many Italian wines a joy. It's not that this is short on class or complexity but that it retains the warmth and carefree pleasures of a weekend somewhere warm. From the cool label to the modern winemaking everything about this wine oozes a relaxed self confidence. The grapes are given a relatively short period in contact with the skins and aged briefly to let flavours develop without becoming too overwrought or jammy. The morello cherry and plum flavours remain fresh and bright while acidity and tannin balance to give structure without dominating. An enjoyable wine for al fresco dining with some good olives, salami and crusty bread. Gavi is a wine I have developed a real soft spot for, whether it is because I am generally keener on Italian reds than whites that when I do find a region I enjoy I cling on for dear life or the balance between alsace florality and burundian richness. Whatever the reason I feel safe selecting Gavi when often I am underwhelmed by other Italian Whites. So the Toledana is a pretty straight down the middle Gavi lovely white blossom floral aroma and clean citrus. The palate is washed by fresh acidity that sets your mouth watering then tart peachy apricot flavours make themselves known like a less rich viognier, the whole thing ends with a touch of chablis like flintyness. There are better Gavi around but as an introduction to the style and for sheer value for money this takes a bit of beating. If you are feeling flush La Rocca is the single vineyard wine widely considered to be the best that Soave has to offer however even the entry level wine has huge class. Soave is within the Veneto region and uses the Garganega grape which in richer soil than that of Soave often gives thin and disappointing wines. However somehow late harvesting and poor soils combine to give something pretty special in the hands of the Pieropan family. They were the first to label their wines as Soave and the first to produce a single vineyard wine so not lacking in ambition or confidence. This is not simply a classic but a region defining wine and like Kellogs it remains the original and the best. Pieropan's wines have a lightness and freshness on the palate which makes it elegant and refreshing yet they are not thin or weak and have a mouthfilling intensity of flavour. The aromatic brightness of spring blossom is matched on the palate by lime and sweeter more tropical fruit which finishes with a hint of buttery nuttiness. If you are used to Garganega being the supporting act to Pinot Grigio in supermarket wines then you owe it to yourself to find a bottle of this wine and have your eyes opened. As ever if you've got any comments I'd love to hear from you.